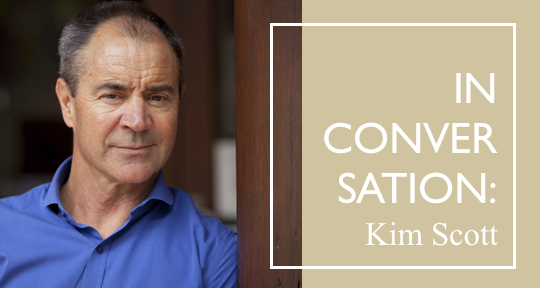 Asymptote readers interested in seeing Kim Scott in person at UWRF can save 20% on a 4-day pass by entering 'MPAS' at the online checkout! In collaboration with this year’s Ubud Writers & Readers Festival, which will be held from 24-28 October, Asymptote is pleased to present this interview with Kim Scott. An Indigenous Australian writer of Wirlomin Noongar descent, Scott has written five novels, two of which—Benang: From the Heart (1999) and That Deadman Dance (2010)—won the prestigious Miles Franklin Literary Award. His latest novel, Taboo (2017), was longlisted for the same prize. In addition to writing novels, he worked together with Noongar elder Hazel Brown to create the account Kayang & Me (2013), transcribing their conversations and interspersing her memories and his, her knowledge and his research, to create a family history of the Wirlomin Noongar people. Scott is also involved in the Wirlomin Noongar Language & Stories Project—an initiative to reclaim Wirlomin stories and dialect for the purposes of fostering and promoting Wirlomin Noongar arts and culture, the wider Noongar community, and the Aboriginal community at large. Asymptote Editor-At-Large for Australia, Tiffany Tsao, had the privilege of interviewing him over the phone in late August 2018. What follows below is an edited transcript of their conversation. We hope you enjoy the first ever Asymptote blog post discussing the Noongar language! Tiffany Tsao (TT): The power of language comes up often in your work: language’s ability to create and cohere a shared culture and community that will restore to the Indigenous characters of your novels a strong sense of who they are and where they belong. What was the process by which you came to this conviction about the necessity of language in Indigenous Australian identity building? Kim Scott (KS): Particularly in Taboo it’s informed by the work I do with the Wirlomin Noongar Language & Stories Project. Earlier on, particularly in Benang, I was still working it out. Benang is in some sense an interrogation of the [Australian historical] archives, I suppose—a sort of deconstruction. And there was an awareness of if that’s all that you’re doing, then it’s a very reactive process. So the alternative, to find something deeper, more nurturing, is Indigenous language itself. And in that book, the sounds the narrator makes, which are so distinctly of place—that’s a metaphor in my mind for Indigenous language. That’s what grounds him so to speak, that’s what nourishes him. It’s almost inexplicable in the language of the archives. There’s also very good research, particularly in Canada I think, that indicates a whole range of indigenous communities’ health and social indicators are much better based on the extent to which they are connected to their ancestral traditions, countries, and language.